Founded by Glenn Morris in 2012, the Ohio Ghost Town Exploration Co. researches, explores, and promotes the preservation of the coolest ghost towns and historic locations in Ohio. The group also goes on several road trips every year to discover what's physically left of them. Ohio is packed with history dating back to the Revolutionary War days and was instrumental in turning the United States into what it is today. Its pioneers, industries, and Buckeye pride are second to none in the nation. The abandoned locations featured in this book aren't normally highlighted on tourism maps or found in pamphlets at rest areas and traveler's service buildings. The main goal is to have them well documented with pictures and information to increase state tourism and raise awareness about interesting places around Ohio that may soon be lost to time and nature. One of the best ways to learn about history is to go where it happened. The people who lived in some of the towns are long gone, but the stories continue to be told through the buildings and items that were left behind. GLENN MORRIS was born in Clermont County, Ohio, about ten miles from Cincinnati. His parents taught him the love of history starting at a young age and it has stuck with him ever since. After spending many years working in a stuffy welding shop, he left on his own accord in 2012 to pursue metal detecting and historical research. 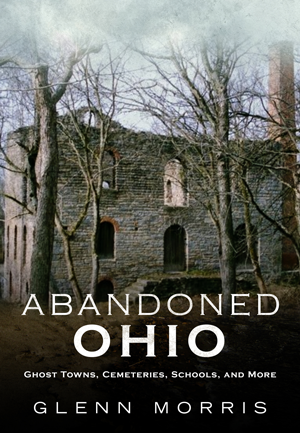 The metal detecting trips turned into a love of ghost towns and abandoned places, so he created the website ohioghosttowns.org. The website gets thousands of visits every month and has over 29,000 Facebook fans and an extensive online network.